Back in the days when I played a lot of guitar (well, to be more precise, I played a great quantity of very little guitar), this strange thing would happen. I’d hear a song, it would appeal to me, I’d write down the lyrics by running the cassette 3 seconds at a time, figure out the chords as well as I could (I was pretty good on the basics, till you get into the minor 7/Augmented 17+s), transpose it into a singable key, figure out some picking or strumming from the very limited repertoire of my right hand, and have a go at it. If it felt good, I’d pursue it, practice it, 20 or 30 or 40 times, and try it in front of an audience (usually starting with my wife while she was making dinner, striving desperately for a “That’s nice, Jeff.”). At that point, it still belonged at least some degree to the original from which I’d pinched it. But after a while–let’s say after playing it 100 times–it became mine. Even if it was a Beatles song which was hardwired in my brain, note for note of every instrument, my treatment gained its own autonomy, and became a living, breathing entity in my brain. It became the default version in my mind’s ear. In 1964 a frat band called the Rhondells from Lafayette College in Easton, PA (not to be confused with the Rhondels from Virginia Beach, VA) was playing a seedy, pre-gambling resort in Atlantic City. They were heard by Nat Weiss, a would-be entrepreneur who actually did book The Beatles’ Carnegie Hall and Shea Stadium concerts in 1964 and 1965. 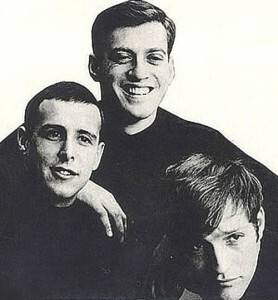 Weiss got the band some gigs in Greenwich Village, changed their name (apocryphally upon advice from his buddy Brian Epstein and Brian’s client John Lennon) to The Cyrkle. After Paul Simon and Art Garfunkel recorded their first LP, a derivative collection of folk standards with a couple of Simon originals thrown in, Paul split for London. Unbeknownst to him, a Columbia Records producer had overdubbed drums and an electric guitar, resulting in the career-making hit “The Sounds of Silence”. Paul had no idea this was going on, and was having a great time with a girl named Kathy and writing a couple of songs with a Bruce Woodley of the Australian band The Seekers (‘Georgy Girl‘). 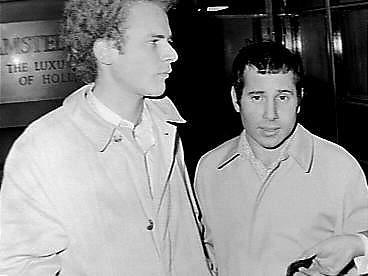 These songs were never recorded officially by Simon and Garfunkel, which makes no sense at all, because they were stars without a catalogue of songs to perform. Don’t blame me, I just bear witness to the events. By the way, this was the time I saw S&G perform in Meadville, Pennsylvania, just the two of them, acoustic, playing their hits ‘SoS’, ‘Homeward Bound’ and ‘I am a Rock’. I walked into the dressing room to interview them, my frizzy hair all a-frizz, when very short Paul looked at his partner and said, “Hey, Art, this guy looks just like you.” They were warm and open interviewees, but mega-stardom was still a year or so away. S&G went on tour, with Cyrkle member Tom Dawes playing bass in their band while his co-founder bandmate Don Dannemann was doing reserve duty in the Coast Guard (I’m guessing you might not have known that fact). Brian Epstein was managing The Cyrkle by then, which gave them no small degree of aura. Paul offered his two songs to Tom, who recorded them under the supervision of master producer John Simon. ‘Red Rubber Ball‘ reached #2 on the charts; and the very lovely ‘I Wish You Could Be Here‘, teetering between maudlin and moving, made it onto their rather unmemorable album (yes, I owned it, and once upon a time knew it by heart). They toured as the opening act for The Beatles in the US in 1966 (now that I think of it— that’s when I saw The Beatles. I must have seen them! I have no recollection of The Cyrkle. I’m really, really sorry, guys. But I guess you probably got enough out of that tour for my not remembering you to not make a serious dent in your memories or bank account.) They had one more hit, the lovely ‘Turn-Down Day‘, which I remember air-guitar singing in a Pepsi Cola factory with my friend Aaron. See, I do remember some things. And I certainly do remember the song ‘Red Rubber Ball‘, because I performed it about a trillion times. It became a sort of signature song for me in the teenie-weenie cyrkle of venues I used to play back then. So here you go, all you bulging and balding baby boomers: ‘Red Rubber Ball’ as performed by The Seekers (I recommend skipping this one), by Simon and Garfunkel in a live recording released on the “Old Friends” compilation in 1997 (don’t miss this one), by Jeff Meshel (use your discretion), and by good old Cyrkle, the version everyone remembers and knows and loved, way back in good old 1966. I notice your lyrics as sung differ a little. Is it intentional? “never see your face again” instead of “never hear your name again,” “the roller-coaster ride you took” instead of “the roller-coaster ride we took”? 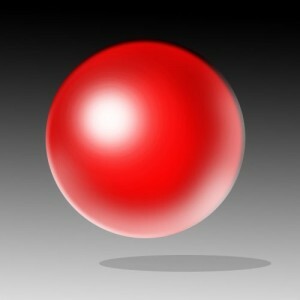 About the song: you write very nicely and I laughed when I saw the picture of the red rubber ball. Seriously? I guess that’s just what I was talking about. I think the lyrics I sang make more sense. It’s ‘my’ song now, in the sense that after all these years I feel it’s bent to my contours. I sure did enjoy hearing the S&G version, though. Shows you why he’s who he is. Loved reading this and listening to all the versions. Thanks! I have fond memories of this song (Cyrkle version, of course). Great stories, Jeff. I see on the web that as of 2001, “Tom Dawes and Don Dannemann, the group’s lead singers, now head their own advertising agencies in New York, where they started as talented jingle writers. 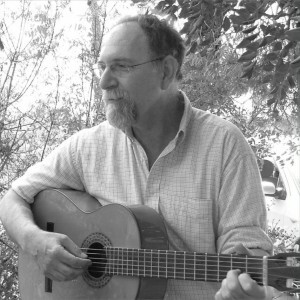 Don Dannemann has written jingles for Continental Airlines and Swanson Foods, while Tom Dawes has had shining success with, among other things, the Alka Selzter “Plop, plop, fizz, fizz” slogan jingle which became a pop culture classic!” Makes you wonder what happened to the third guy. I saw the Cyrkle live in Milwaukee in 1967 where they headlined a show of 6 forgettable bands outside at Milwaukee County Stadium. I guess they were on the way down by then because the Stadium held 56,000 people and there were only, say, 3,000 in attendance. 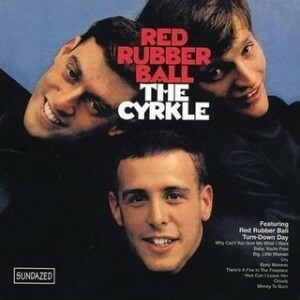 The Cyrkle played Red Rubber Ball. It looked and sounded like they were lipsynching to a prerecorded track being blasted over the Stadium speakers. I much prefer your version and I plan to erase the memory of that Cyrkle concert soon to free up some much needed brain memory space.